This article is part of our Member Blog Series, which showcases Playful Pittsburgh Collaborative Members' efforts and commitment to ensure that play is a critical element in the lives of people of all ages. Each month, a different member organization will share their take on how play is a part of the work they do. The Playful Pittsburgh Collaborative hopes that these stories of play from our diverse set of member organizations will encourage and inspire leaders in communities, businesses, schools, and families to prioritize play every day. On Wednesday, October 18, a remarkable thing happened. James Brown songs boomed down the block. Kazoos, cowbells, and hats with plumes paraded back and forth across the street. Children, older adults, and everyone in between danced and carried signs reading “Watch for Crossing Neighbors” or “Drive like your Nonna lives here.” If you were passing through the Bloomfield Bridge Intersection after work that day, it’s possible you even glimpsed a hula-hooping dinosaur. Why all the mayhem and silliness? Because play attracts attention. It builds relationships. It sparks change. This was Pittsburgh’s third performance of The Crossings, a series of pop-up street performances that build visibility around pedestrian safety for all ages and abilities. The events are organized by Lively Pittsburgh and part of a countywide movement called Age-Friendly Greater Pittsburgh. The Age-Friendly initiative, which is led by Southwestern Pennsylvania Partnership for Aging (SWPPA), brings people of all ages together to make their neighborhoods more inclusive and respectful of every generation. The Crossings is Action Item #1 in the newly-released Age-Friendly Greater PGH Action Plan, which was recently approved by the World Health Organization and AARP. On this particular Wednesday, more than 90 residents and advocates came out to the intersection where Liberty Avenue, Main Street, Howley Street, and the Bloomfield Bridge meet in a starfish-shaped web of traffic. Many Bloomfield residents go out of their way to avoid walking or biking through this confusing mass of motion and activity. Ted Cmarada of Lively Pittsburgh described the Bloomfield Bridge Intersection as the most dangerous of the three locations where The Crossings has been performed in the city. Part of the importance of a safe Bloomfield Bridge intersection is its proximity to many sites of play, among them a community swimming pool, hockey rink, baseball field, and elementary school. And with nearly 20% of residents ages 60 and older, Bloomfield is one of the 10 oldest neighborhoods in Pittsburgh. 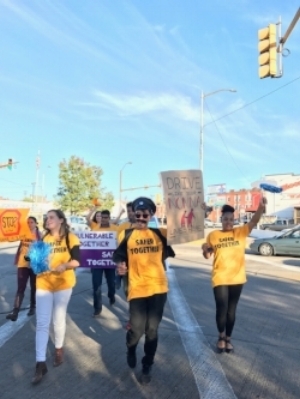 Age doesn’t necessarily mean that folks are in need of help, but Bloomfield’s diversity in age and ability is a call for safer, more walkable streets—for everyone. An intersection that’s easier for a 90-year-old to navigate is easier for a parent pushing a stroller or someone lugging home grocery bags. The Crossings is principally about welcoming play and silliness into the world of advocacy, but also remaining cognizant of what’s at stake. Several local residents said they came out to this performance of The Crossings because they, or someone they love, had been hit by a car in Bloomfield or nearby Lawrenceville. When Age-Friendly Greater Pittsburgh brought The Crossings to Lawrenceville last spring, a 72-year-old woman named Rose crossed her street for the first time in her five-and-a-half years of living there. Rose uses a wheelchair, and the lightning-fast Penn Avenue traffic makes it dangerous for her to enter the crosswalk immediately in front of her home. How can we play in our neighborhoods if we can’t walk, bike, drive, or wheel around securely? Part of the mission of The Crossings is to build visibility, but the performances are also meant to ignite change. The Bloomfield Development Corporation (BDC), with the help of Bloomfield Livable Streets, is administering a survey that will yield specific policy proposals to make it safer. As of today, they’ve received more than 700 responses. If you know the intersection, think about sharing your thoughts and helping them reach their goal of 1,000. Five University of Pittsburgh students from the Masters of Social Work program are also helping the BDC conduct and analyze a traffic study of the intersection that will include vehicle, pedestrian, and crash data. The group will distill the study and survey results into a report for the Mayor’s Office, City Council, and the Urban Redevelopment Authority of Pittsburgh (URA). As Bloomfield residents know, this intersection is in dire need of creative reconsideration. We perform The Crossings because it keeps play for all ages at the center of that process. So the next time you see us out there with our feather boas and our bells and our tambourines, we hope you’ll stop, just for a minute, and play alongside us. To learn more about Age-Friendly Greater Pittsburgh, email shayna@sayhellotochange.com. And join us for the next performance of The Crossings by emailing jjablon@livelypittsburgh.com.